One exceedingly useful feature in TSM is the ability to create custom price sources. Several of my groups rely on custom price sources and in this post I will cover when they make sense as well as how they work. What is a TSM price source? A price source in TSM is a named variable that represents some pre-defined price. This means you can refer to the price source by name and TSM will look it up for the specific items in your groups when it executes a shopping or auctioning scan (or any other operation that relies on price sources). The most commonly used price sources are usually dbmarket and crafting. DBMarket is a weighted average of the AH price of an item over the last 14 days. The massive advantage of price sources is that you do not need to set hard coded gold limits for all your auctioning operations. In stead of manually calculating the crafting cost and recalculating when material prices change you can just use 120% crafting for all your crafted items as the minimum price. This is how I can get away with using the exact same operation for ALL of my crafted transmog groups. TSM comes with a lot of pre-defined price sources, and they are adding more sources in TSM4. There’s a lot of nuance to how you use them at a higher level, but that doesn’t matter for people just starting out. In addition to the premade sources you can create your own price sources. TSM supports a decent amount of math and logic functions that you can use. This will allow you to create more elaborate logic for your pricing settings. The main advantage of using a custom price source is that it is very easy to change, and it will impact all of your operations. It can also make your operation settings look much cleaner. One obvious use case is if you want to use the same pricing settings, but differentiate the other settings for a set of operations. If you use custom price sources for min, normal and max prices you can easily change them all the same place. This is what is used in the mining guide I published for instance. One of the most famous TSM strings in the game is BilisOnyxia‘s sniper string. It utilizes the check() function to setup different logic for different price levels. You can use the same logic in a custom price to cover a lot of items with one operation. This is especially useful if you want to enter a market without optimizing your TSM settings. It will give you some quick and well functioning pricing that can be used without much thought. I use a price source similar to the sniper string for my Battle Pet groups for instance. 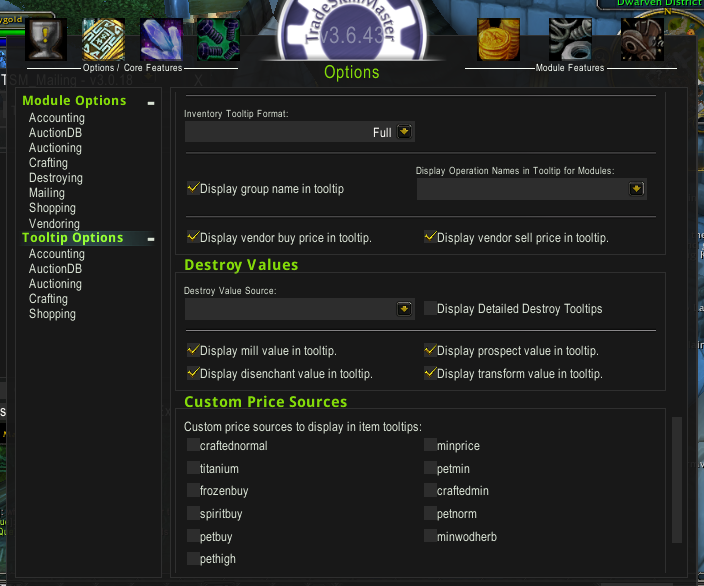 In TSM 3 you can find the area for custom prices on the main TSM window when you type /tsm into chat. I’ll take you through an example for how to setup custom prices for a normal crafting based setup. The first thing you need to do is define a name. The name is what you will use to refer to the custom price in your settings. It is usually best to choose a name that is not too long, but is fairly descriptive. I have published custom prices for several of my setups. Names include Spiritbuy for the price of Spirits of Harmony and minwodherb for the cheapest Warlords of Draenor herb. The example price we will make is a normal price for crafted items so we will call it craftednormal. The next thing we need to do is to define what the price source is. This can be very elaborate or very simple. In this case we will use a setup that is slightly more advanced than the most simple setup. The normal price is the level at which your auctions will be posted when no others items are posted on the Auction House. There are two main concerns when choosing this level, you want an adequate profit margin, and you want to post it at a level where it is likely to sell. I use a formula that compares 200% crafting, which yields a 100% profit margin and 150%dbhistorical. It then chooses the highest as the normal price. This setting will guarantee that I get a 100% profit margin. If the historical value for the item is even higher it will post it at that level. If you want to limit the price to make sure you do not post your items too expensively you could use the same setting with min instead of max. You would need to add some logic to make sure it does not end up below your crafting cost in that case though. Custom prices can be as sophisticated or as simple as you want. To learn the logic required for strings with different results for different items I suggest looking into some logic or programming tutorials. Most programming languages will use if statements of some sort and this will help you think about how to use the ideas. You can also add custom prices to your tooltips so you can see how they change for a given item if you change them. This option is found under Tooltip options. Good luck! This is a very powerful tool, especially with the new sources coming in TSM4. Goblin Mindset: Is gold making ethical? What is the point in having very sophisticated custom strings vs somewhat above avg pricing strings like you stated in your post? I understand that you can make it more detailed in what you want it to do, but to what extent? There can be several advantages. You can use a string that uses different pricing levels for different items based on some value source. Then you don’t have to put your items in different groups, but can use the same operation for all of it. For very active players they may effectivel decide the market price so they may want to use formulas to set the raw gold price. Using averages of different sources can also give you prices that are more accurate across realms and still takes your current realm into account. Interesting, so how does it take affect in a broader sense. Meaning, do people who hace a higher knowledge of complex custom prices sell more ? Or is it just more efficient in TSM with groups/operations for processing. Which may save you a few clicks in the long run? The advantage is mostly in markets where dbmarket is very variable. Using a more sophisticated string can give you more control of which price level you post your auctions at. This should give you better prices overall in the sense of getting the best possible balance between profit margins and sale rate. That sounds wonderful. Having a balanced price would sound more appealing to buyers especially if I have enough auctions up in that particular market, if I am understanding you correctly. I know you said that in order to find out more about using sophisticated custom sources I should look at programing code. To that remark, I agree to a certain extent but Coding like python and html seem like someing that would be too much information for just wanting to learn advanced custom Prices. I have looked on the internet for something more advanced to learn from and all ofnit that I found was on a basics to slightly above average level. That I already know how to do. Could you possibly recommend something or someone that might be willing to help? The idea behind programming was just to get comfortable with stuff like IF statements and how they work. Outside of that you just need some understanding of mathematics. I don’t know any specifically useful resources for that sadly. The idea will generally be to use either weighted averages or if statements to get your pricing string to work for more situations. You can also use sources related to specific other items to make sure your price follows a correlated market. At the end of the day these are mostly quite advanced use cases and you generally do not need them. Sheyrah just posted a great explanation of her new transmog string that should give you a great idea of how a more sophisticated TSM string looks and the logic behind some choices. You can find it on reddit here. I’ll probably do something similar once we get into BfA (and I’ve actually upgraded some of my strings). can you enter a specific price for an item in TSM 4? Sometimes i have an item i will sell at a specific price routinely. Lets say if i had an item i sell for 999g normally, can i set that as a sales price, rather than use a string? I haven’t had success so far….It seems to enter some astronomically high number. What would be the format to use, if you can? Thanks. Can’t believe I missed this comment. You can do this quite easily by just entering 999g in the price field.